Full versions of accepted papers will be published online on this website. The proceedings will have an ISBN number and will be indexed in EBSCO database. 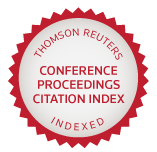 All papers that will successfully pass double-blind review process will be published in a printed book proceedings indexed in the Thomson Conference Proceedings Citation Index (formerly ISI Proceedings) accessible at the Web of Science. Only papers corresponding to the conference topics and to the format guidelines will be published. Publication of papers in the proceedings is conditioned on a positive assessment by reviewers. Programme Committee reserves the right to publish accepted papers on the conference website. The best papers will be published in a special issue of Economic Modelling (impact factor = 0.736). Please visit the journal’s website for more information (http://www.journals.elsevier.com/economic-modelling). Selected papers should follow the guide for authors (http://www.elsevier.com/journals/economic-modelling/0264-9993/guide-for-authors). Selected papers will be published in a special issue of International Journal of Monetary Economics and Finance (indexed in SCOPUS). Please visit the journal’s website for more information (http://www.inderscience.com/jhome.php?jcode=ijmef#absindex). Selected papers will be published in an edited book. The book is to be published by a leading international publisher in Economics and Finance. The special issue has been announced by Economic Modelling, The International Journal of Theoretical and Applied Papers on Economic Modelling. We welcome your submissions and only authors who presented their papers at the conference: 15th International Conference on Finance and Banking: 25 Years of Transition in Central and Eastern Europe, are allowed to submit the papers. The special issue has been announced by International Journal of Monetary Economics and Finance. We welcome your submissions and only authors who presented their papers at the 15th International Conference on Finance and Banking: 25 Years of Transition in Central and Eastern Europe, are allowed to submit the papers.